Additional sun awning for the bow of the yacht. Mike and Lizzy have been sailing together for nearly 10 years – in fact they met as crew racing on a yacht! Together they have sailed around Greece, through the Dalmatian islands of Croatia, along the picturesque Amalfi coastline of Italy and the timeless French Riveria within the Mediterranean as well as the Leewards Islands, British Virgin Islands and Spanish Virgin Islands of the Caribbean and Bermuda. Most of this time has been enjoyed on charter yachts providing luxury vacations. Welcoming guests aboard with a friendly, warm attitude and an eye for detail they consistently provide holidays of a lifetime for their delighted visitors. Having sailed from an early age, Mike’s passion for boating in general has gained him a wealth of knowledge on sailing and motor yachts up to 80’ long. He likes to pass on his enthusiasm to everyone on board, encouraging and teaching others more about sailing. 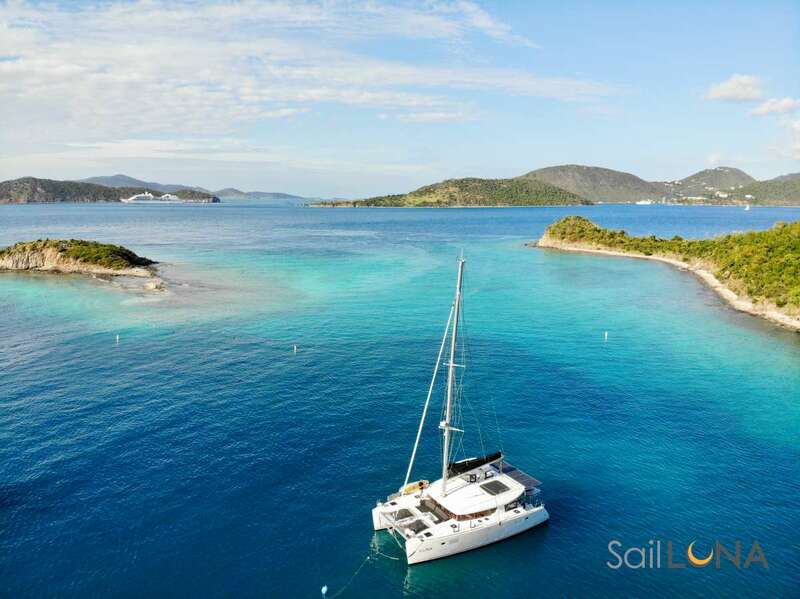 Mike has been lucky to have sailed in many areas of Europe and the Caribbean both personally and professionally, including logging over 20,000Nm in the last 4 years alone as a Captain on crewed yacht charters. A great sense of humour combined with a professional approach, an open and relaxed manner, not to mention his skills behind the bar, ensures Mike gets all guests to enjoy every moment aboard. Lizzy developed her love of cooking with fresh local produce stood on a chair helping her Mum prepare meals in the family farmhouse kitchen. Following a degree in Outdoor Pursuits where Lizzy learnt to sail, she travelled the world by land and sea. The experiences Lizzy had at this time influenced her cooking and expand her repertoire. After adding the finishing touches at the prestigious and world renowned Ashburton Chefs Academy in the UK, Lizzy now takes great delight in combining 2 of her passions: serving up beautiful tasty food her guests enjoy and, of course, sailing! Offer: For any remaining dates May, June, July through August 16 Aoibh is offering a 7 night charter for up to 8 guests for $20,500. Not valid on previous bookings. Send us an inquiry to get specific pricing for Aoibh. Thank you so much for an amazing report and taking such great care of our clients. They had rave reviews of their week with you and said it was absolutely perfect and the food was simply amazing. After talking to Teresa yesterday, I´m pretty certain that they will book again. Good things must come to an end! Looking foreward to our next sailing adventure now that Mike and Lizzy have shown us how awesome it can be. You will be missed but not forgotten because I have your info and will be a pest! Wouldn’t want any other crew! Great trip! Mike and Lizzy are awesome and made this great trip beyond amazing. Some new experiences with friend. What an incredible adventure sailing the BVIs with Mike and Lizzy! Fantastic, amazing, breathtaking – just BRILLIANT! As a first timer I had no idea what was in store but soon discovered magic on the sea. Mike and Lizzy – you out did yourselves in so many ways – you guys MADE this trip and have left u sleaving wanting to come back and we will be back! What an exceptional week! My family and I came aboard with great excitement - not disappointed. Lizzy & Mike made us feel quite a home aboard AOIBH. Captain Mike is an exceptional sailor which was evident the minute the sails were hoisted. and Lizzy was a good complement with her sailing skills and a Chef extraordinaire. We were treated to the best meals, forced to eat homemade breads repeatedly. Many thanks Lizzy and Mike, your attention to safety, tireless work skills and good humor were most appreciated. P.S. I’ve chartered a lot. This is one of the very very best based on overall experience!! What a great time! Playing on the water, playing under the water, playing on the surface of the water and playing in the rainforest. First paddle board xperience and I stood up...mostly. Fabulous advice on where to go, what to see, what to do and how to avoid tat jewelry. the recommended hikes/walks with great views that got better around every corner. Lizzy and Mike you both were so welcoming & calm & caring from day one to the (sadly) end. You turned an extraordinarily location into a spectacular vacation. Thank you for everything! FA and I wanted to drop you a personal note to say thanks for everything you did during the trip and I think I speak for everyone in saying we all enjoyed it and appreciated your hospitality. We also now appreciate the “hard yards” Mike did, especially when not feeling well (the steaks were brilliant - no offence Lizzy) as we have one by one, come down with the same thing and FA even needed to go to the Clinic here in Barbados yesterday!! She is on the mend and hopefully the rest of us will recover fully in a couple days. From our first foot aboard until the last you were both wonderful hosts and such an excellent skipper & chef partnership. You greeted us with a warm welcome that set the tone for the whole holiday .... thank you. The on-board accomodation was spotless and somehow the colour schemes throughout the cabins and craft maintained the feeling of calm and luxury that the Windward Islands promised ... not even the odd choppy crossing put us off - loved the gingerbeer tip. Even when it did rain on those few occasions, you quickly ensured we kept dry! Your suggested mooring places were stunning and we thoughly enjoyed being able to take that ´first thing in the morning´ dip before getting ready for breakfast. Thanks Mike for the gentle approach to water tubing - you allowed me to go ´just fast enough´!! Lizzy, your menus were balanced, varied and tastebud pleasing. Every meal was a delight from Mike´s pre-dinner cocktails and table settings to your meals prepared with care to bring out flavours we all enjoyed .... our highlight had to be the steak you selected and marinated before cooking them to all our varied requirements ... nothing seemed too much for you both but we know only too well how hard that is to achieve. I so enjoyed your handmade sushi - brilliant flavours and presentation ... and thanks for your alternative lunch for Tony. The variety of breakfast was a first for us ... we´ve only ever been provisioned with standard breakfast fare - cereals, toast yogurt juices & coffees and occasional alternatives.... becomes a bit monotonous which your menu avoided! The variety of menu over the two weeks was superb and those of us requiring minor adjustments to your mouth-watering menu were made to feel special rather than a nuisance. Your fish and chicken dishes were all such good quality, introducing us to local jerk menus as well as the British & Mediterranean cuisine you promised. The off-catamaran Lobster lunch experience was amazing. Wines were of excellent standard and complimented all your superb meals. You are both such lovely people, warm and generous but professional to the last. Mike, your first-class helmsmanship shines out - the safest of skippers if ever we had to name one! What a trip!! Thank you so much for looking after us so well on the beautiful Aoibh! We had the best time thanks to your amazing hospitality, great navigational skills finding some of the most breathtakingly beautiful spots, fantastic company, wonderful meals and stunning scenery! The list goes on! I’m hard pressed to pick a favourite moment but the beach shacks in Bequia, swimming with turtles in Tobago Cays, and drinking rum and drumming with locals on Meyreau! Lizzie your cooking skills too were next level!! Thoroughly depressed not to have your wonderful meals every day! The trip has given us some amazing memories to treasure and I’ve attached a few of our fav photos! We’re now back in gloomy old England after 10 days in the mountains of Slovakia. Although it was nice, it’s difficult to compare it with the tranquility of what you guys have out there! We just wanted to say another huge thanks for what will be one of the most memorable trips of our lives! Your knowledge of the area and ability to barge your way to the front of any mooring spots didn’t go unnoticed Mike ;) And Lizzi, I genuinely mean it, if you ever think of quitting sailing, you will have a long and prosperous career as a top Michelin Star chef! They will come from far and wide for your food, we promise! :) I just can’t imagine the havoc you could wreak in a full sized kitchen! On that note, can you send a picture of the cheese cake recipe from you book of secrets? We want to try and create it once more, TRY being the key word there! I hope we’ll get to catch up one day in the future and when you’re in the UK, if we have a track day on, come along and I’ll show you life in a slightly faster and definitely less relaxing way! All the best for now and a huge thanks once again! I just can not thank you enough for the spectacular week we spent with you two on the boat. We all knew we´d get along good since we often vacation together as a group and you two just blended right in with us. Between Lizzy´s amazing meals she prepared and Mike constantly pushing us beyond our comfort zones to try new things it will be a trip we never forget. I can´t wait to try these recipes to see if they match up as hers did. Hugs to all and keep in touch! Thank you both for an unforgettable holiday. We truly enjoyed the week and we were really glad to be able to spend it with you. All the places we visited were amazing and the food & hospitality we experienced was fantastic. Everything was perfect – it couldn’t have been better. We are very happy & especially with Lizzy & Mike who made things superb. All breakfasts are served with tea, coffee, fruit juices, cereals, yoghurt, toast and jam. Tropical fruit parfait layered with Caribbean honey, Greek yoghurt and boat-made granola. Spring onion potato cakes with bacon, poached egg and boat-made ketchup. The Captain’s Pancakes served with a fresh fruit platter, jams, honey and Canadian maple syrup. Smoked salmon with scrambled eggs on buttered brown bread. Croque Monsieur or Croque Madame: toasted Swiss cheese and Black Forest ham sandwich with a Gallic twist. Many lunches are accompanied with freshly baked bread. Beef tacos with boat-made salsa, boat-made guacamole, cheese & lettuce. Pan-fried jerk and honey fillet of salmon with mango salad. Quiche Lorraine served with boat-made pesto. Griddled asparagus with prawns and rouille. Shrimp Linguine in a lemon cream sauce. Nicoise Salad with pan seared tuna. Spiced apple baked Camembert cheese with a selection of fresh cut Crudités. Dragon chicken wings with a yoghurt, mint and lime dip. Stuffed mushrooms with crispy herb bread crust. Marinated beetroot with goat cheese. Stuffed mini baked potatoes with garlic and herb cream cheese. Provencal-style rack of lamb on potato dauphinoise with roasted broccoli and buttered French beans. Trinidadian Fish Stew with nutmeg, sweet potato mash, baby carrots & garden peas. Pork tenderloin with mashed potatoes, caramelized apples and a calvados and shallot sauce. Champagne risotto with seared scallops and garlicy mozzarella bread. Citrus roasted fresh Wahoo on a potato rosti with citrus vinaigrette and mange tout. Prime tenderloin steak with minted new potatoes, Greek salad and coleslaw. Sticky jerk and brown sugar pork ribs served on pineapple rice with a sweet chilli and pineapple chutney. Poached pears with cassis coulis and fresh berries. Basil and white chocolate cream with balsamic strawberries. Coconut Panna-Cotta with rum roasted pineapple. Lemon tart topped with fresh raspberries, raspberry coulis and cream. Chocolate and Grand Marnier mousse finished with praline and a tuille wafer. Mimosa jelly made with freshly squeezed orange juice set with champagne.